If you were expecting higher marks than what you have actually then going for revaluation is what you need. To do that, you must write a formal application letter for rechecking of paper to make sure that your exam results are correct. 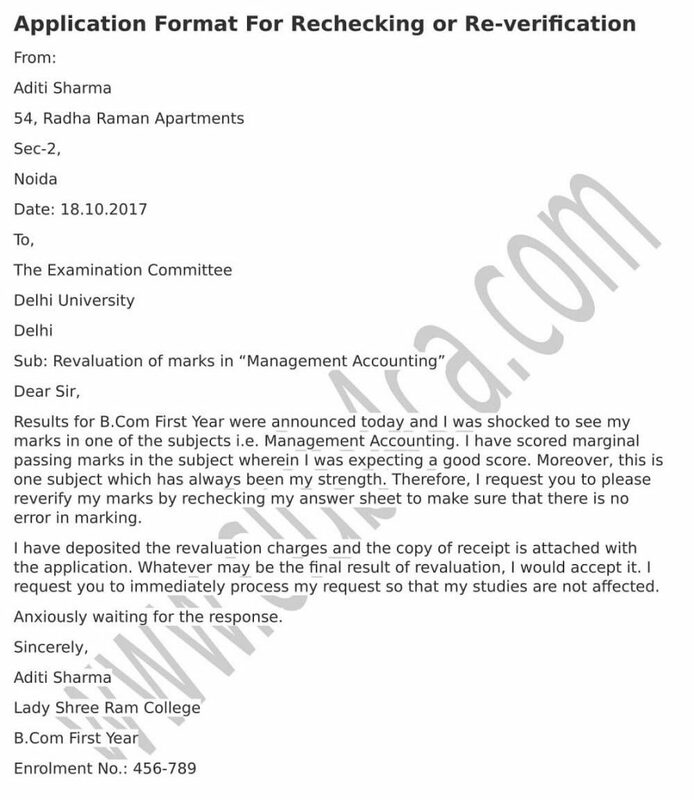 Application for revaluation of marks is a simple application which is suppose to include basic details in relation with the exam paper which you want to have revalued. We have the application format for rechecking of paper. Use this re-checking letter format to create a formal letter to submit to the examination committee. Results for B.Com First Year were announced today and I was shocked to see my marks in one of the subjects i.e. Management Accounting. I have scored marginal passing marks in the subject wherein I was expecting a good score. Moreover, this is one subject which has always been my strength. Therefore, I request you to please re-verify my marks by rechecking my answer sheet to make sure that there is no error in marking. I have deposited the revaluation charges and the copy of receipt is attached with the application. Whatever may be the final result of revaluation, I would accept it. I request you to immediately process my request so that my studies are not affected. Anxiously waiting for the response.